This article originally appeared in the Southwark News on February 8th 2001. The Isthmian League (currently sponsored by Ryman) was England’s premier amateur football competition before the war. Based in London and the south east, the likes of Wimbledon, Wycombe Wanderers, Woking and Kingstonian later went on to higher things whilst others such as Leytonstone and Ilford amalgamated when hard times came. Others still, completely folded having once been the cream of the amateur game. Strangely, there was no trophy for the winners of the Isthmian League – “Honour sufficed” as their motto reads. Between 1908 and 1939 Isthmian teams were winners of the FA Amateur Cup, the biggest prize on offer, on no fewer than 15 of the 27 finals contested. The greatest and most respected of them was, of course, Dulwich Hamlet, four times winners of the Amateur Cup. But on league results alone Nunhead figure as the league’s third best pre-war team. In 1938 Nunhead Football Club celebrated its golden jubilee. To mark those first fifty years a small booklet recording the club’s history was published. It closed expressing the wish that “the club remain faithful to its heritage,” continuing “and may its future be worthy of its past.” Yet in a few short years Nunhead Football Club ceased to exist and was banished to the record books. What happened? 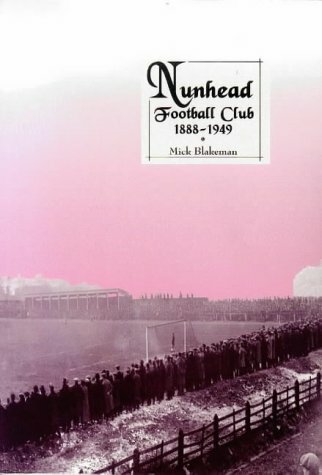 In his book Nunhead FC 1888-1949 author Mick Blakeman explains how the club, contemporary with its local rivals Dulwich Hamlet, grew from humble beginnings to become one of the top amateur sides in the country. Their most successful side won the championship in 1929 and 1930. This thoroughly researched book includes a season by season account of how the team fared in the league and cup competitions; gives a detailed list of all the players; and shows a number of rare photographs and illustrations. Indeed, the attractive cover adorning this lovely book is a panoramic view of a Nunhead derby with the Hamlet from the early 1920s. 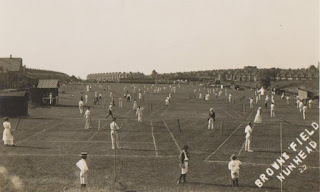 Lining the terraces is a large crowd of several thousand men and boys crammed into Brown’s Ground, their home since 1908, each one (without exception) bedecked in customary hat or cloth cap and overcoat. Brown’s Ground in St Asaph’s Road, was Nunhead Football Club’s home ground for over thirty years, and the story of how they came to lose possession of it, is really the underlying story of Blakeman’s book. As early as 1937 there were fears that they could lose the ground in just four years time. The governors of Haberdashers Askes, who controlled the lease to Brown’s Ground, were determined that it would not be renewed. The decision, they said, was in the best interests of the boys at the school, who would gain a very large playing field for their own physical education. Where that left the schoolboys who supported Nunhead every Saturday afternoon we are not told! Sir Stanley Rous, the Secretary of the Football Association, said that steps would be taken to try and avoid the situation, but here was an early warning sign of the club’s eventual demise. Perhaps supporters didn’t really believe that their beloved club would soon be homeless. If they did they might have acted a bit more urgently than they did. By January 1939 the Nunhead officers were told that there were practically no hopes of the club being able to renew the lease on Brown’s Ground when it expired at the end of the 1940-41 season. They should start looking for another ground immediately. Nunhead Football Club, it was said at the time, “was a light that should never be allowed to go out.” Even the local MP, Lewis Silkin, got in on the act, saying he had no fears for the future of the club, and ensured it would live on – despite there being no alternate venue available as headquarters. War intervened to put a further spanner in the works. Then Fate dealt another cruel blow in 1940 when the timber business of Eddie Mash, the club’s treasurer, was destroyed by enemy aircraft during the blitz. This latter blow couldn’t have come at a worse time, and it more or less sealed the doom of Nunhead, as its chief benefactor went out of business. Only a few years earlier in 1936, Mash had kindly dipped into his own pocket to pay the £700 costs of rebuilding the clubhouse after it was badly damaged by fire. Eric Mulley, the club’s renowned goalkeeper during the glory days, took charge of the sorry state of affairs for a number of years but was eventually unable to pay the rent for the ground. Things never really got going following the war and it was only a matter of time before the death knell was sounded. The light “that should never be allowed to go out” was finally put out in 1949 and the penniless Nunhead FC was wound up. What makes this book so timely is that a similar situation has arisen today  with Nunhead’s friendly old rivals Dulwich Hamlet. For a modern day Mr Mash read Steve Dye, chairman of DHFC Ltd. Over the past decade Dye has ploughed hundreds of thousands into the ailing club to keep it alive. At the beginning of the 1990s he managed to secure a deal that saw the former crumbling Champion Hill stadium razed to the ground and rebuilt as a smaller, and he had hoped, more manageable site. But Dye now admits his own lack of foresight when Sainsburys built the current Champion Hill stadium. It was realised too late that there were a number of design faults, making the Hamlet complex prone to vandalism, as well as incurring a huge rate bill. With current spiralling debts and a short-term lease, it is little wonder that Dye is hoping that Southwark Council accepts the planning permission for the new ground redevelopment with Homebase. This will give Dulwich Hamlet the freehold to Greendales, a piece of derelict wasteland that for many years has been used for little else than a dumping ground. A new cycle route will also link up Dog Kennel Hill with Greendale cycle path. The inclusion of much needed sports facilities for local schools; including an all weather pitch, cricket nets and tennis courts, will further develop the community relationship that Dulwich Hamlet FC has cultivated for a number of years already. Where Nunhead and Haberdashers were at loggerheads, it is hoped that DHFC and the new Charter School nearby will form a tight bond. What is uppermost in the minds of many local people, as well as football supporters throughout the United Kingdom, is that Dulwich Hamlet Football Club - with no disrespect, a far greater light than Nunhead ever were – are guaranteed survival well into the future. This article originally appeared in the Southwark News, February 8th 2001. 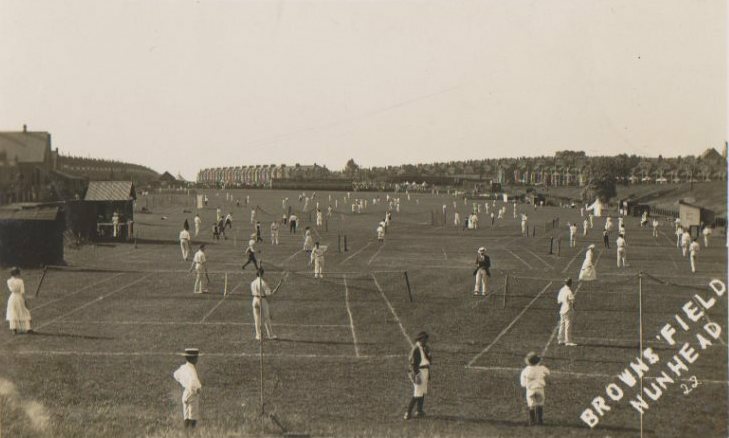 The Final of the London Junior Cup took place at the Crystal Palace in Sydenham, on March 12th 1898. Dulwich Hamlet FC was then in its infancy and had only been in existence for five years. 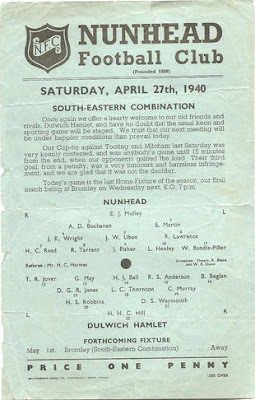 The same year saw Dulwich win the Southern Suburban League with 'Doddy' Wight as captain. On the long route to the Final at the Crystal Palace ground Dulwich had to get past Old Londonians, St Mary's Putney, Wimbledon Old Centrals, Townley Park and Hendon. After two scoreless drawn games the Final (second replay) was eventually won by three goals to nil by Commercial Athletic at Highview. However, the Hamlet went into the following season lauded as the 'London Junior Cup Team' bringing about much needed publicity. The London Junior Cup was eventually won in the 1899-1900 season, at the end of which Dulwich Hamlet became a Senior team. The picture below is from the reverse of the match card / programme. It is currently up for auction on Ebay. 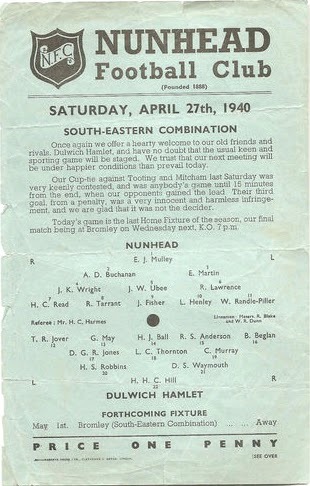 Two very early Dulwich Hamlet matchday team sheets (programmes?) have turned up on Ebay. The Isthmian League matches date from before 1910. One is against Clapton from December 1907, the Hamlet's first season in the Isthmian League, and features three of the famous Buck brothers in the inside forward positions. The match was drawn 1-1 and Sydney Buck scored the Hamlet goal. Another sheet from 21st November 1908 shows the line-ups for the visit of London Caledonians. The score in this match was 3-0 to Dulwich. Ford, Tyson and Vasey got the goals. A third dates from 1913. It would be nice if a Hamlet fan with an Ebay account would bid on these items to bring them back to Champion Hill.